To say Joyce’s journey thus far has been unconventional would be a gross understatement. Growing up deep in hurling country in County Kilkenny, Darragh Joyce was practically born with a hurl in his hand. With his sporting future seemingly mapped out before him, the young hurling prodigy’s older brothers Kieran and Conor paved the way, the former enjoying sustained All-Ireland success with Kilkenny at the highest level. Joyce’s adept ability at the ancient Gaelic game culminated in lifting the Irish Press Cup aloft, having captained Kilkenny to All-Ireland minor hurling glory. But now, nearly four years later, the 21-year-old is staring down the barrel of a debut in what was once a foreign game in a far-off land. Unlike most Irish converts though, Joyce's Gaelic football career never extended into club level. The ex-hurler has learned from two of St Kilda’s best coaching assets in Lindsay Gilbee, widely renowned as one of the best exponents of the drop punt in the game’s history, and defensive stalwart Danny Frawley. “I’ve been doing a lot of work with Spud (Frawley) on bodywork to put me in a good position to either intercept or spoil it, so just doing the basics week in, week out, and a lot of kicking with Lindsay (Gilbee) as well, so it’s all paying off,” Joyce told saints.com.au. Home is never too far away for the Kilkenny man though, and a last-minute flight booking means the Joyce family will be represented at the MCG on Sunday. “Me Mam’s on the way over now, so she’ll be here in less than 24 hours, which is great,” Joyce said. Upon revealing to Joyce that he was to make his debut, senior coach Alan Richardson reassured him that his captivating story had nothing to do with his senior selection. “I’ve been involved with a few Irish boys over the years, and you came in as green as anyone that I’ve worked with, so it’s a real credit to you,” Richardson said. “You’re in because you’ve earnt it. It’s not a novelty thing, it’s not a ‘righto, we haven’t quite had the results we’re after, so let’s just have a look at the list’…that’s not the case. Richardson also drew on Joyce’s exemplary work ethic both on and off the field. “You’ve earnt the respect of your teammates, and that’s what I want,” he said. 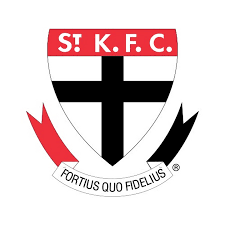 Darragh Joyce becomes just the third Irish-born player to represent St Kilda in VFL/AFL history, following Dermot McNicholl (3 games, 1990) and Colm Begley (1 game, 2009).